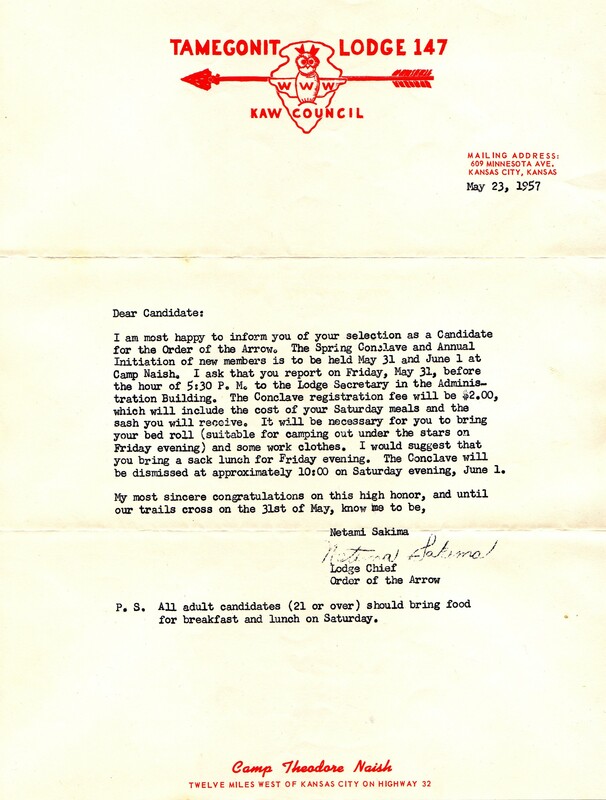 An interesting bit of emphemera…Tamegonit Lodge stationery dating from 1957 inviting an elected candidate to Camp Naish for induction into the Lodge. It provides some insight into how lodge inductions were done at that time. 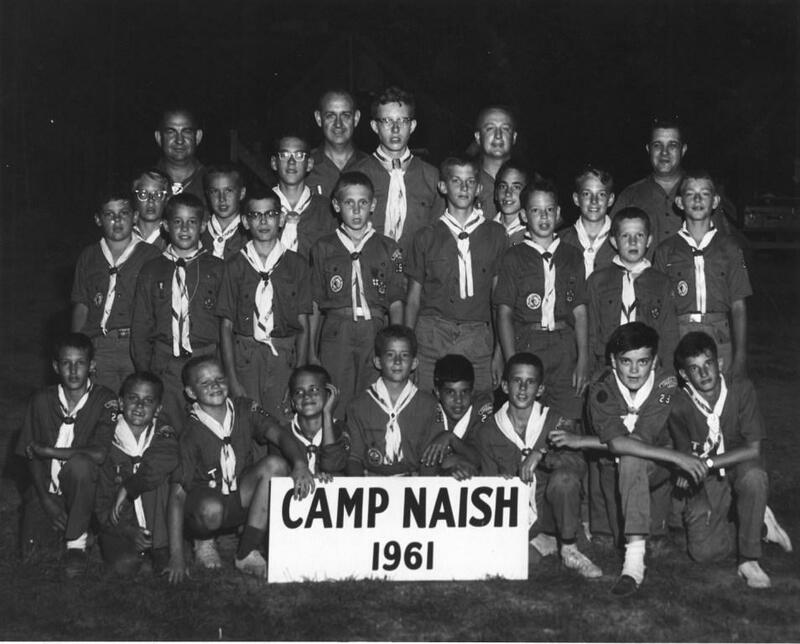 It appears that “Initiations” were held annually at the Spring Conclave as opposed to the frequent induction ceremonies at summer camp and on varios spring and fall weekends the lodge hosts now. Another interesting note is the inviation to bring one’s own sack lunch for use during the Ordeal. If I had known that was an option, I would have brought something more substantial than a cheese sandwhich, hard-boiled egg and an apple! 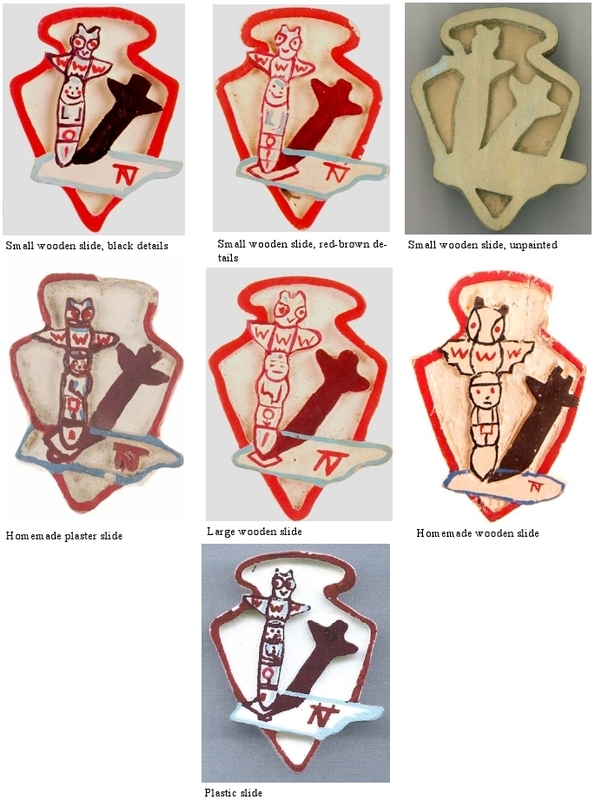 I’d be interested in getting scans of Tamegonit letterhead from different eras. Do you have something from an earlier or later date? 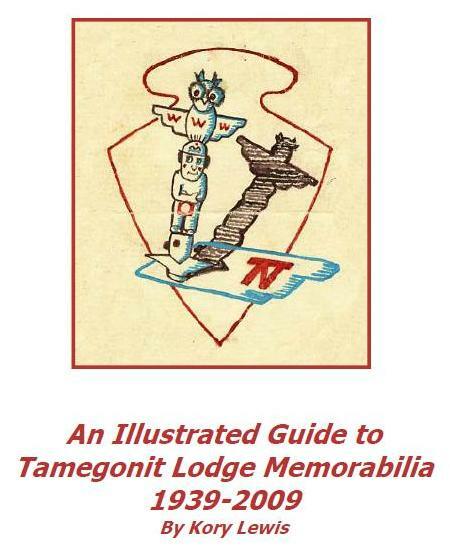 Due to recent requests, I am pleased to announce the availability of a local pick up option for copies of An Illustrated Guide to Tamegonit Lodge Memorabilia. As an alternative to paying shipping fees, I am offering copies of the book for $15 with local pick up. Please contact me at broadkawvalley@gmail.com and I will give you two options on where to pick up a copy of the book (my home in Prairie Village or my office in Lee’s Summit). Please be aware that this option depends on product availability…I tend to run out of stock from time to time and it takes about 5 business days to receive an order. Drop me a line and we can set up a time to meet. My dad is at the far left in the second row from the front. 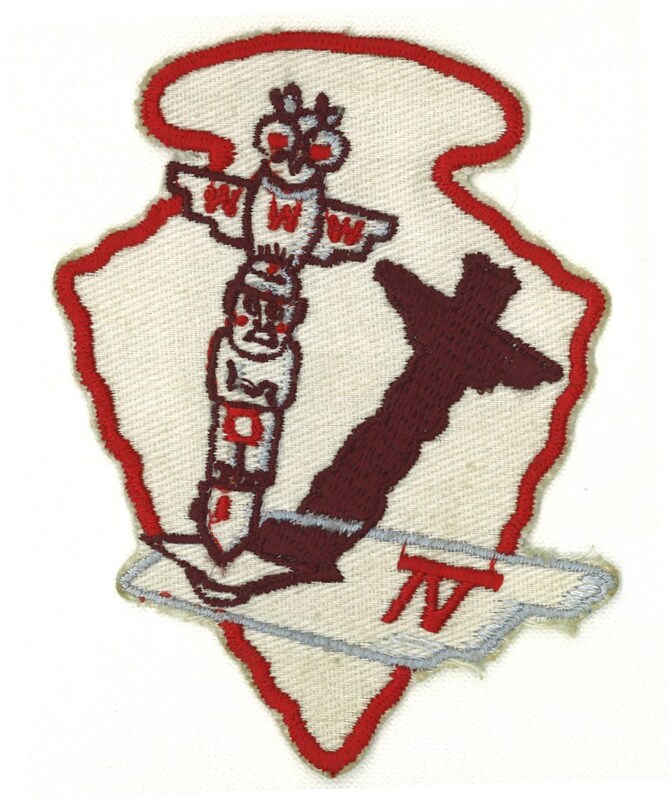 One interesting thing I spotted in the picture is the wooden arrowhead neckerchief slide from Tamegonit lodge worn by the leftmost adult in the back row. Another interesting note about the picture is the stamp on the back which states “Weeks Photo Service, 5060 Clark Drive, Shawnee Mission, KS”. My wife and I used to own a home at 5123 Clark Drive, just a few houses down from the address for Weeks Photo Service. I also have his troop’s information packet with a packing list and camp songs from 1960. I’ll get that scanned and posted soon. 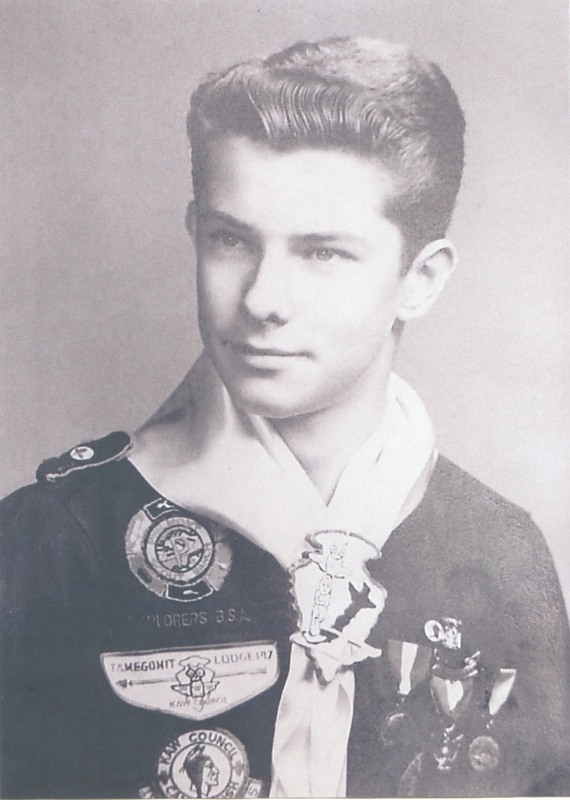 Does anyone have any old troop pictures or know anything about Weeks Photo Service? Once again, Ryan Meador is organizing the Greater Kansas City Area Trade-O-Ree Boy Scout Swap Meet and Memorabilia Show. All of the tables are sold out, so it should be a good show. I’ll be there on Friday night with copies of my book, An Illustrated Guide to Tamegonit Lodge Memorabilia. Hope to see you there!